For some reason, I really love documentaries. I love documentaries about interesting and offbeat topics (Murderball, Air Guitar Nation, King of Kong, The Parking Lot Movie). I love documentaries about important environmental topics (Who Killed the Electric Car?). But most of all, I love documentaries that highlight our society's problems with food, especially those that expose the seedy underbelly of McDonald's, factory farming, or our own beloved government (Food Inc., King Corn, Supersize Me). 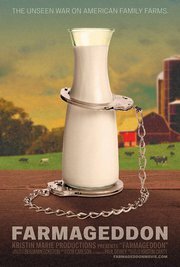 This week, I managed to snag a couple of free tickets to see Farmageddon: The Unseen War on American Farms (http://farmageddonmovie.com/). It was eye opening, sad, distressing, educational, and very well done. It told the stories of small farmers who had unwittingly incurred the unwanted (and unwarranted) attention/ire/wrath of various governmental agencies and suffered the horrendous consequences. Among the various stories told, there was one theme that really caught my attention. Raw milk. Our government hates raw milk. It's okay for us to smoke cigarettes, drink alcohol, or take prescription drugs with hideous side effect, but our government WILL protect us from the raw milk. I have been left with an overwhelming urge to now drink raw milk. There are some intriguing (but slightly suspicious) claims that it can help with asthma, so that's worth a shot. But really, the movie just made me feel angry and wanting to do something. There's not much in my power that I can do, but I could probably get my hands on some of that tantalizingly illegal liquid. I'm having trouble finding myself some pet food raw milk. I'm looking online, but I don't think anything is available locally. So now I guess I'm in the market to buy a partial cow with the intent of drinking a controlled substance. I have a mission.